Is it me or has it been hard to get back in the swing of things this week? I have been exhausted, no motivation! I’ve been forcing myself to exercise this week, and the snacking has been horrible. I’ve been eating healthy snacks, but to much of it! This past weekend I made another one of my pancake creations. I really love my yogurt pancakes. I can’t get over how fluffy, light and filling they are. My Husband even had some for the first time this weekend, and he liked them! Thats a big deal since he’s so picky. He ate his before I could even sit to the table! I made these with a little banana, but next time I will add more, if you don’t add maple syrup you can taste the banana but if you do add, which I did, you don’t really taste it. I only added 1/2 a banana but next time it will be a full one! 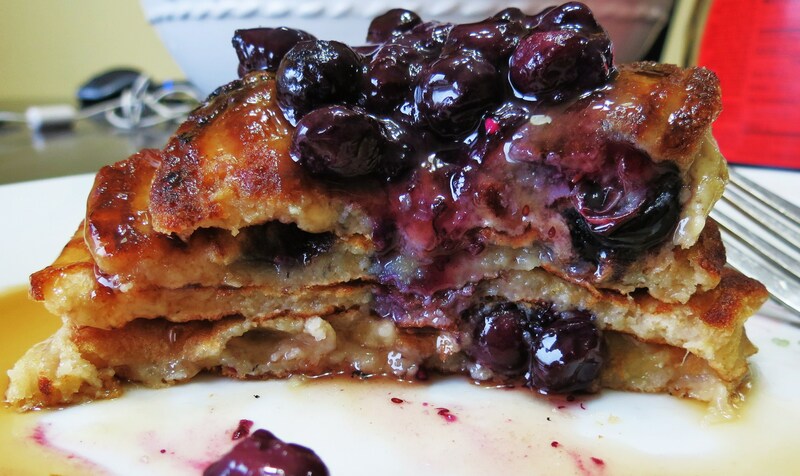 These pancakes are so fat, that you can actually see the blueberry popping out of them! The strawberry shortcake pancakes are still my favorite, but these give them a run for the money. My goal this year is to make as many different kinds of pancakes as possible. I have some great recipes I already made up, I just have to give them a try! It’s amazing of the meals you can turn into pancakes. I think with all the December cookies and pastries I have been craving berries! I bought two big bags of frozen strawberries and a bag of mixed berries. I just love them, frozen or fresh! I’m thinking smoothies soon, just waiting for my banana’s to get a little more ripe! 5.) Place 1/4-cup batter onto non-stick skillet and cook till bubbles start appearing through the top of the pancake and then flip. NOTE: Cook on medium heat and I flattened out my batter with the spatula to cook more evenly. 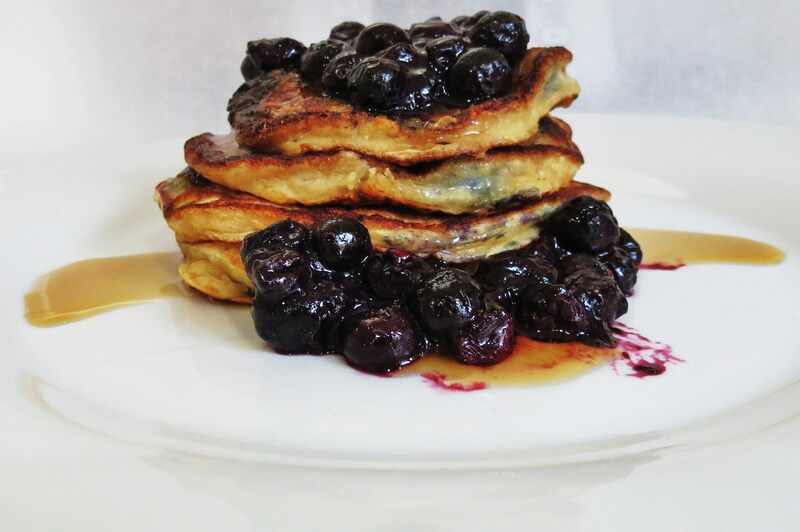 In a sauce pan, add remaining banana and blueberries and stir until thick, mashing blueberries, about 5-7 minutes. Pour over top of pancakes. 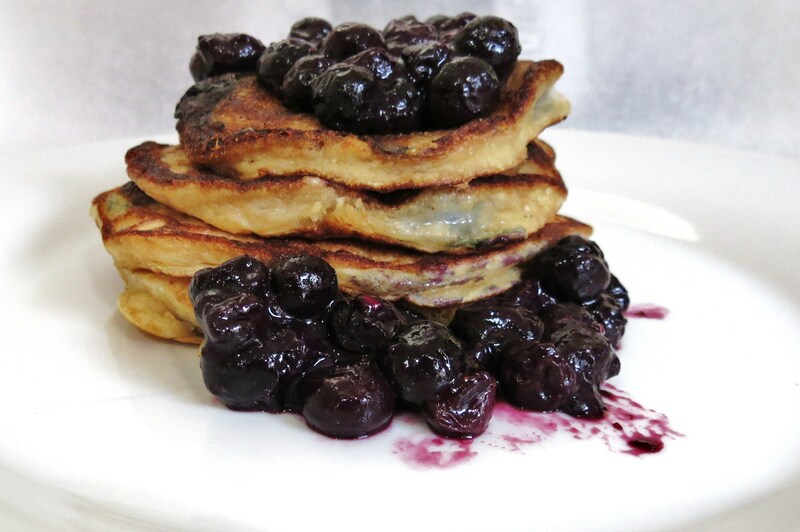 Note: I used frozen blueberries for sauce and fresh for pancakes. 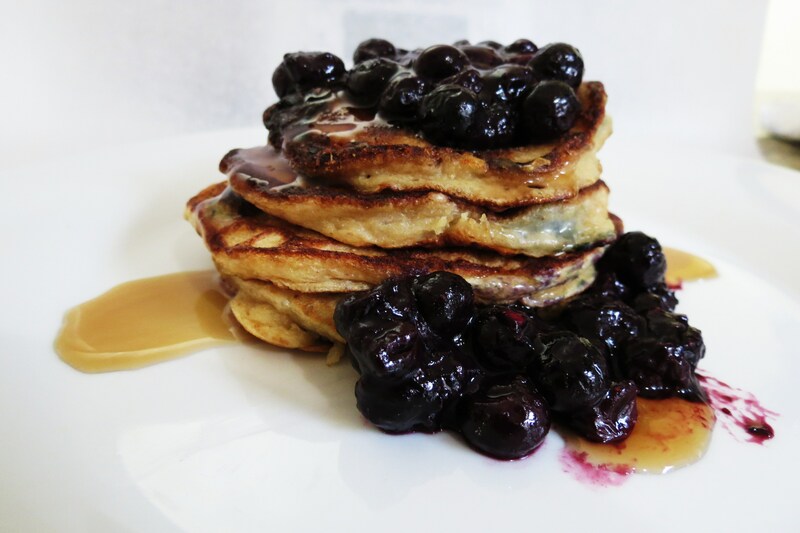 Have you tried my Yogurt Pancakes? If you haven’t you really need to. It’s fast easy and so darn good! QUESTION: What is your favorite kind of pancake? Sorry for the background on this picture, but I had to show you the inside of my pancakes! Well, we did it! Lets be thankful we made it to Friday. Big plans for the weekend? Not me, just more recipe creating! I got a few hidden up my sleeve. I will also post a few more healthy vegetable dishes in the coming weeks! Have a wonderful weekend, and I’ll see you back here on Saturday! Great idea, yogurt pancakes. I like a high protein pancake, so I’ll check these out ~ thanks! Oh you should! Let me know if you do and what you think! I so agree! I love fresh blueberries! I must buy two pints a week! Matter in fact I need more today! I also love your blog! I read it everyday!! I couldn’t agree with Maureen more. I’ll be making this with a GF flour blend, but everything else will stay the same! 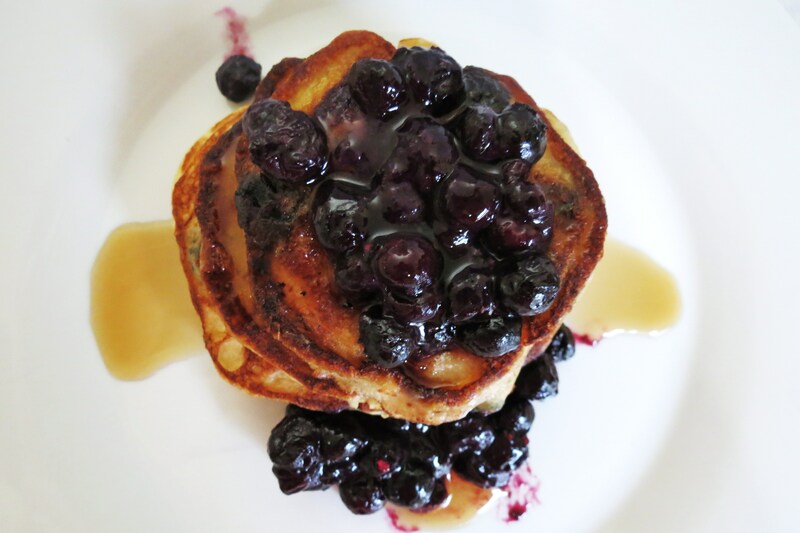 Your pictures are making me crave some blueberries right now. These look terrific! 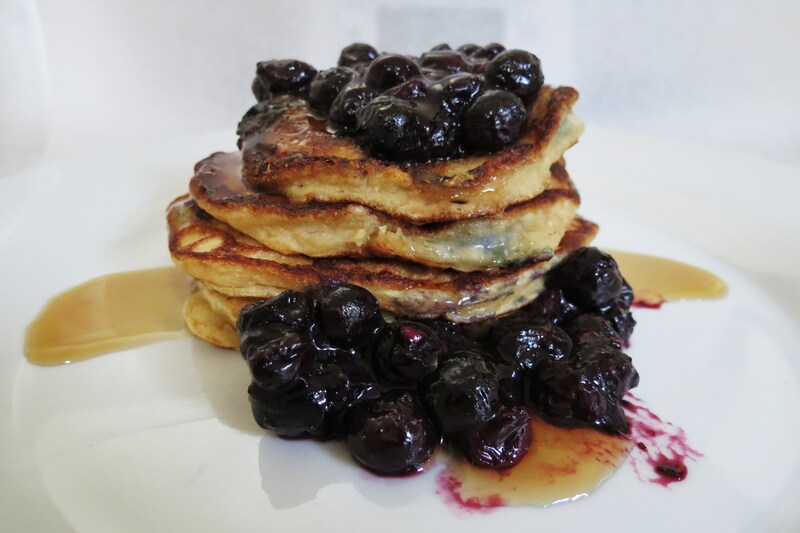 I have to say my favorites are old-fashioned whole wheat pancakes with blueberries! We just love them! I hope you are well – I was thinking of you today! Thanks! I’m doing fine, just a little sore! 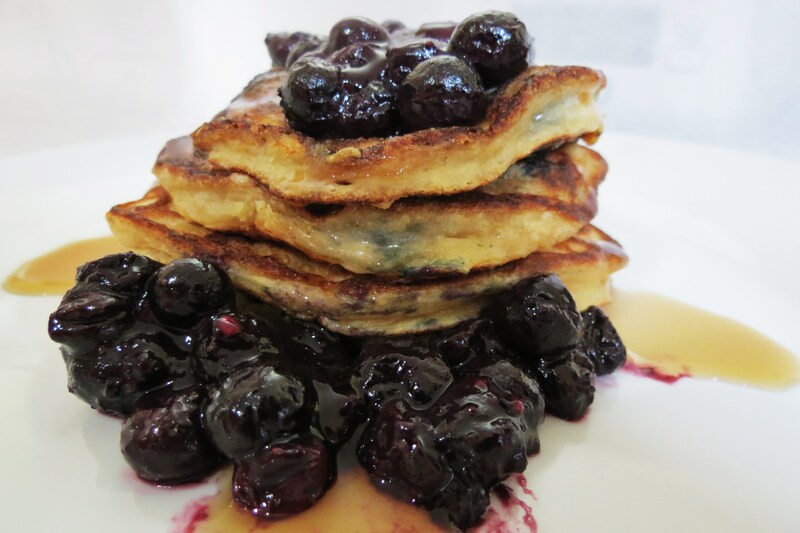 I have to say blueberry pancakes are the best traditional pancake, I love them!! Wish I had some for breakfast right now. Yummmmy! Thank you Jen for all these ideas. I am losing weight and becoming healthier. I also have a huge sweet tooth and this helps on that end. It gives me healthy alternatives. 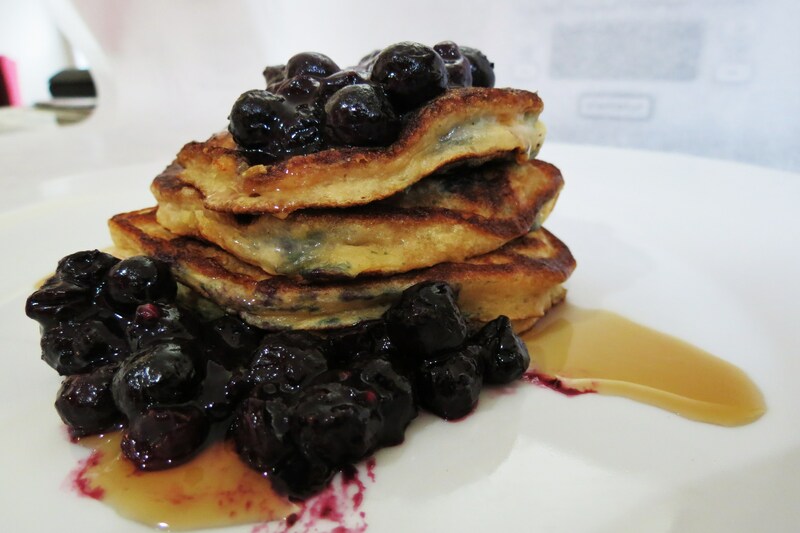 Plus, I loved these blueberry-banana pancakes. They were delicious! Your welcome!!! So glad your becoming healthier that is so awesome!! Glad you liked the pancakes, there one of my favorites!! !